1) Manually add client card details. 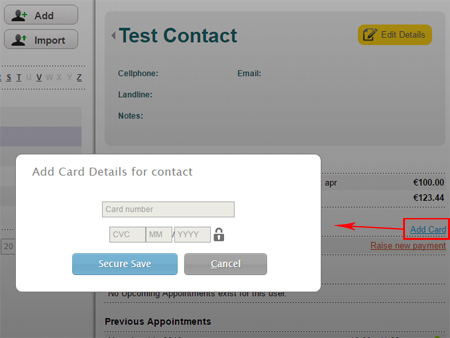 2) Gather payment details when client places an online booking. When viewing a Contact. Click the “Add Card” option on payment details. Use this to manually enter the payment details for a client. 2) OR you can gather payment details when client places an online booking. Under “Online Booking Setup”. Switch the Online booking validation method to the “Credit Card” option. When this option is switched on then if a new client books an appointment from your website they will confirm their appointment by entering their payment details. 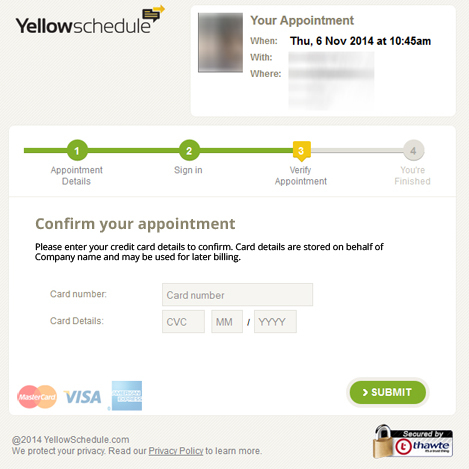 This is how it will look when a client completes their online booking. Once clients details are added raising new payments (and making refunds) are easy.